Adopting the thought the world is our stage and the home takes on the central role, the team at Wolf Architects has created a real heightened sense of drama & theatrics with this stunning open Parents Retreat or Ensuite, as it is traditionally known. When you think about it we spend a lot of time in the bathroom over the course of our lives so why not make the act of brushing your teeth of shaving your legs more enjoyable? Preparing for a day, making up and then in the evening coming down and relaxing & recharging the batteries. With this thought applied the team at Wolf chose to raise the floor of the ensuite creating a stage, this wonderful spotted gum platform defines the space which is open to the bedroom and at the same time it creates the “stage” for the performance of bathing! This master bedrooms ensuite features two glass boxes on the east & west axis with the vanity & the freestanding bath providing a wonderful balance and sense of symmetry to the space. 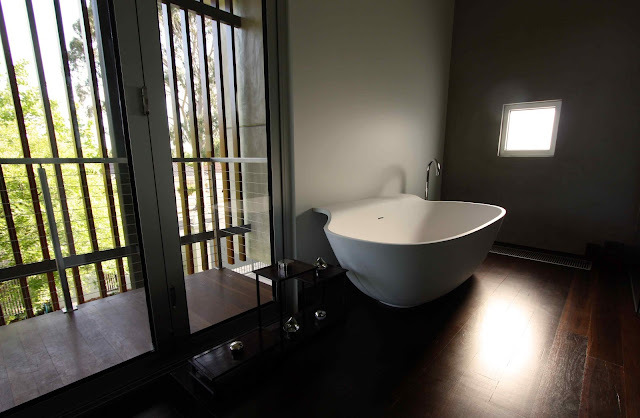 The glass boxes act as a display box to showcase the activities within; the act of showering is a body ballet! In between the two cubicles is a battened timber walkway, which is the drying area to the shower recess much like a draining board; this space has a overflow drain underneath. The full height frameless glass helps to highlight the high ceilings and adds as sense of scale. 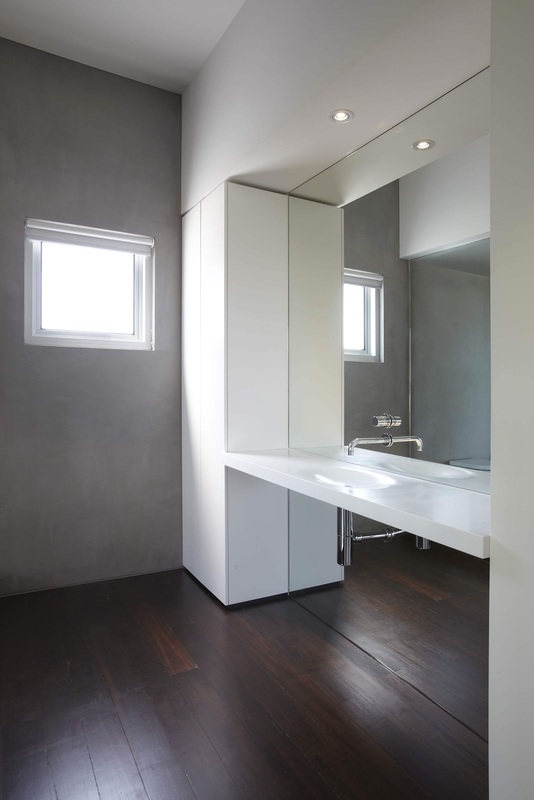 The Vanity area is an example of quality craftsmanship, precision engineering and detail; A customized Minosa Scoop®ED washbasin was selected for its simplicity and elegant beauty that is in keeping with much of Wolf Architects design philosophy. The Minosa Scoop®ED washbasin floats between two tall storage units (vanity) and appears to float out of a mirrored wall. The mirror below the Scoop®ED washbasin increases the spaciousness of the room and also allows you to see yourself from the bathtub directly opposite. Bathrooms being a space you normally feel with your feet and hands the design team at Wolf was very conscious of the surface textures and their respective temperatures. The timber is selected for its smooth and warm feel and to contrast this they selected flamed and brushed Bedonia Sandstone in the display cubicles. The Minosa Scoop®ED washbasin made from Corian® by DuPont™ is also a very smooth & tactile material that is very warm & soft to touch. The Scoop®ED is seductive and encourages you to run your hands along the whole length of the plane that integrates the bowl and work surface effortlessly into one easy to clean and look at surface. Against all this is the concrete wall to the East, which is, the exterior brought in. 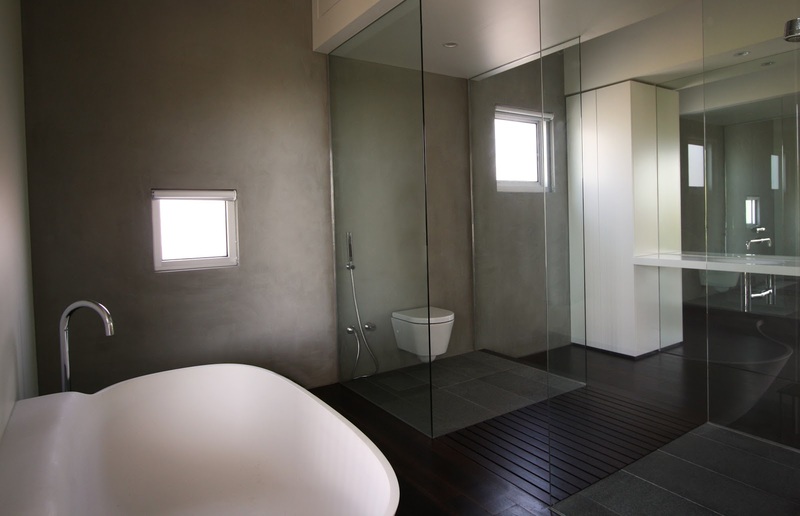 Operable windows from the North, East and West provide an abundance of natural light and ventilation making this Master ensuite a very fresh and uplifting space the perfect open Parents retreat that defines the needs of the modern home and the clients it has been designed for. 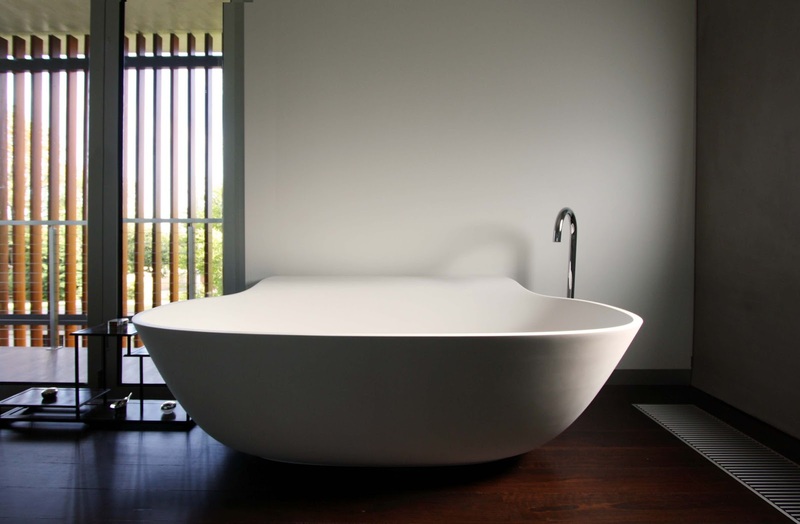 This Ensuite defines luxury bathing. Please email Darren – Darren@minosa.com.au for hi res DropBox link if you are interested in this project. Or you can call on 02 8090 9039 or 0417 232 414 for further information.